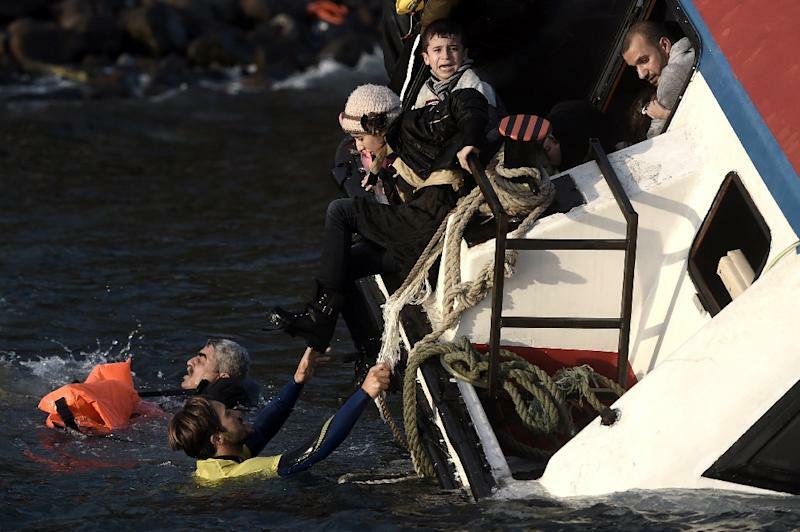 Athens (AFP) - At least 17 children drowned when three boats sank en route from Turkey to Greece, officials said Friday, the latest tragedy to strike migrants braving wintry seas to seek asylum in Europe. Nine adults also lost their lives when the boats went down, with the drownings once again highlighting the human cost as Europe struggles with its worst migrant crisis since World War II. Although rescue officials in Greece and Turkey managed to pull another 157 people from the water, such drownings have become an almost daily occurrence as thousands of people brave high seas and wintry weather to make the crossing on flimsy, overloaded boats. Greek Prime Minister Alexis Tsipras expressed "shame" over Europe's failure to prevent yet another "humanitarian tragedy", and said it was crucial to prevent the Aegean Sea from becoming a graveyard for people fleeing war and misery. Most of the deaths occurred off the Greek islands of Kalymnos and Rhodes, where 22 people drowned, among them 13 children, when two boats went down overnight, port officials said on Friday. In total, 138 people were rescued from the two boats, with the coastguard continuing its search for survivors. To the north, an AFP correspondent witnessed another boat foundering off the island of Lesbos, with a group of desperate people perched on the roof screaming for help. 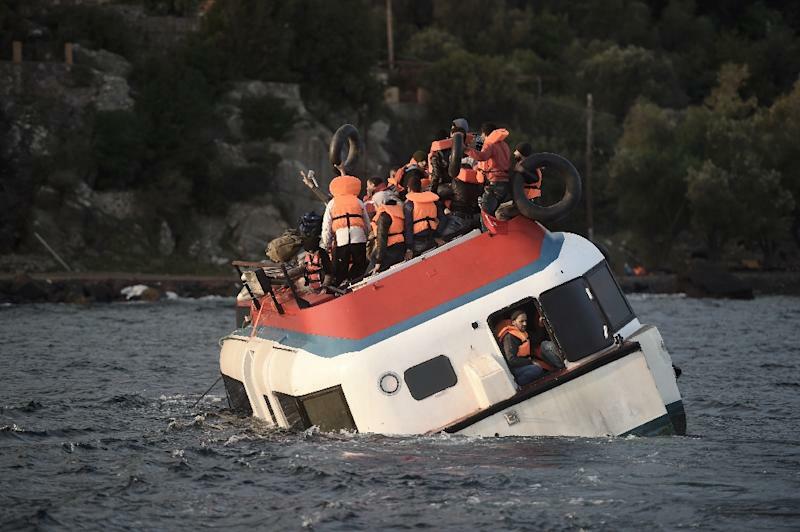 Another four young children, all of them Syrian, drowned when their flimsy boat heading for Lesbos capsized in bad weather, although the Turkish coastguard rescued 19 other people, the Dogan news agency reported. The latest deaths came after 17 people drowned off Lesbos and Samos on Wednesday, 11 of them children. Despite worsening weather at the onset of winter that has made the already hazardous sea voyage even more dangerous, a record 48,000 refugees and migrants arrived last week in Greece, the International Organization for Migration (IOM) said. "As a European leader, I feel shame over Europe's inability to defend its values," Tsipras told the Greek parliament as news of the latest deaths emerged. 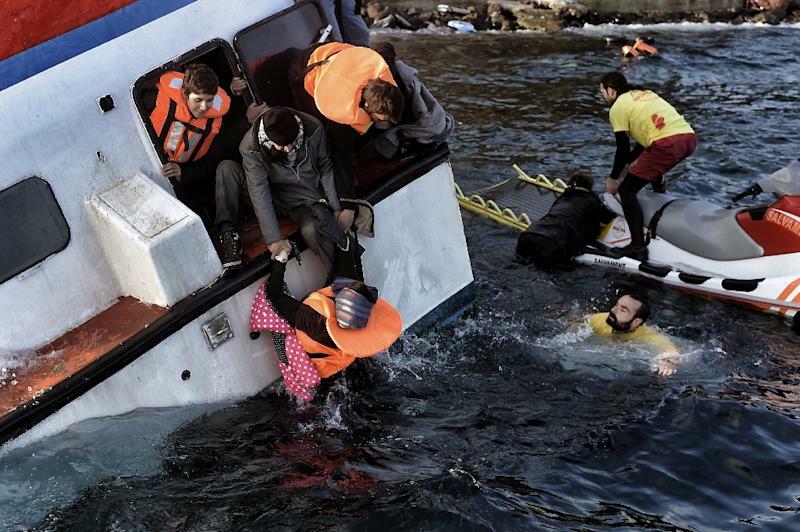 "Our first duty is to save lives and not to allow the Aegean to become a cemetery." The Greek leader also underlined the urgent need for Turkey to "respect its commitments" to halting the flow of people leaving its territory by boat and stressing Athens' willingness to be "a link between the EU and Turkey" on the matter. With winter gales whipping up at sea, the UN refugee agency (UNHCR) said there was an "urgent need" to strengthen search and rescue capacity in the area. "We have warned for weeks that an already bad situation could get even worse if desperate refugees and migrants must continue to resort to smugglers who send them out to sea despite the worsening weather," the UNHCR's Alessandra Morelli said in a statement Thursday. "Our fears are now being realised. Nearly every day now we are seeing children, parents, the elderly and the young dying as they try to reach Europe." In Spain, rescuers were searching for at least 35 people who had been on board a boat which ran into trouble after setting sail from northern Morocco on Wednesday. Fifteen people had been rescued from the troubled vessel on Thursday. Since the start of the year, 560,000 migrants and refugees have arrived in Greece by sea, out of over 700,000 who have reached Europe via the Mediterranean, according to the International Organization for Migration. More than 3,200 have died during the perilous crossings, the vast majority on the longer sea route from Libya to Italy. Most are heading for Germany, which is expecting up to a million asylum requests this year, prompting a backlash against German Chancellor Angela Merkel. But on Friday, Merkel found an unexpected source of support from former nemesis Yanis Varoufakis, Greece's ex-finance minister. Varoufakis, an outspoken critic of Merkel's austerity-for-aid response to the Greek debt crisis, said her actions regarding refugees had been exemplary. "As a European, it fills me with great pride how Chancellor Angela Merkel is reacting," he said. "I wish everyone in Europe would do the same."